Welcome to this blog on "The Story of Sarawak". I am a Sarawakian, born in Miri (my birth certificate states that I was born in the Shell Oilfields Hospital). My family moved around the state when I was very young (so I've stayed in Bintulu, Sebuyau etc). Eventually I did my schooling years in Kuching, before going abroad for further education. Even though I'm now based outside Sarawak, I try to go back as often as I can ... and one day I will go home for good. I've always liked History back during my schooldays, but over the past few years I have taken a special interest in the colourful history of Sarawak. Few places tell such a riveting story that includes pirates, headhunters, explorers, rebellions, war, love & enmity, colonisation, occupation and independence. This blog is intended to bring some of those stories to others who may not be as familiar. Even Sarawakians may learn something new about their glorious past. Recently one of my schoolmates mentioned a certain textbook in a Facebook discussion. 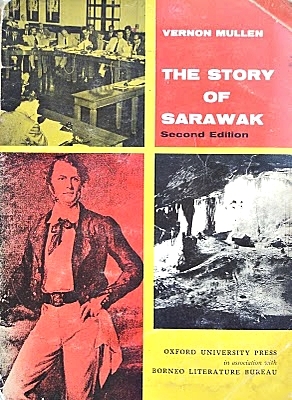 It was called "The Story of Sarawak" and written by Vernon Mullen. I remember that this book was used when I was in primary school back in the 60s.. I wish I had preserved my copy for posterity ... especially since I'm quite sure my old textbook was a First Edition (the one shown below is the Second Edition). A lesson to schoolchildren today ... don't be too hasty to throw away your old textbooks after exams are over. They might be valuable one day. So inspired by Mullen's textbook, I've decided to also call my blog "The Story of Sarawak". Well, once again welcome to this blog. Check back frequently as there will be regular postings. My name is James Yong and I will be your Website Jaga (Malay for "Guardian of the Website"), to guide you on this journey through the annals of Sarawak history. I also urge you to contribute whatever you know about Sarawak history and traditions. Send me info, photos, clippings and anything interesting. I can be reached at jslyong@hotmail.com . If relevant, I promise to post your contributions. Together we can create a rich tapestry on the story of Sarawak, beyond what any static textbook can offer.